Few things manage to shock me. This does: that the man, Fritz Haber, responsible for the Zyklon B formula, the killer gas used in concentrations camps, was also awarded a Nobel Peace Prize. Also he was born Jewish. I learn this while reading ‘In the Garden of Beasts: Love, Terror, and an American Family in Hitler’s Berlin’ by Erik Larson. 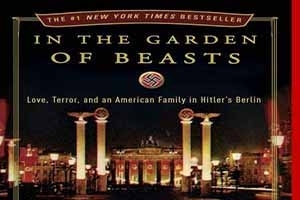 Garden of Beasts is a heavy read about the ‘adventures’ of the hapless American Ambassador (Dodd) to Germany during Hitler’s time, and his impressionable daughter. It’s a dense read with lots of names and lots of information crammed onto every page and though this can get overwhelming, for those interested in this time period it is never the less a very worthy read. Although Larson does not go into Dodd’s feelings about segregation in the U.S. (this is not a book about civil rights in the U.S. though connections would have been welcome), I did wonder about Dodd reconciling his disgust with separate benches for Aryans and Jews, versus all the separate amenities for blacks and white in the segregated South. In one of the final chapters, chapter 55 ‘As Darkness Fell’, Larson mentions ‘a strange episode’ i.e. while driving Dodd has a hit and run with a four year old black girl. Considering Dodd is the hero, if you will, of In the Garden of Beasts on account of his sense of right, wrong, fairness and moral righteousness, his subsequent reactions and actions after this accident are a very interesting look into this man’s ethics in his ‘own’ world.Dodd did pay her medical bills and the girl did recover, but Dodd did not stop at the scene and he also wrote a rather interesting letter to the girl’s mother. Which makes me ask: are we someone else abroad and someone else at home? Also it is often said that a country can be judged by how well its animals are treated. The next quote struck me because whenever I have taught how to write well-rounded characters, one of my examples is always the fact that as horrid as Hitler was his dogs loved him and he loved his dogs.